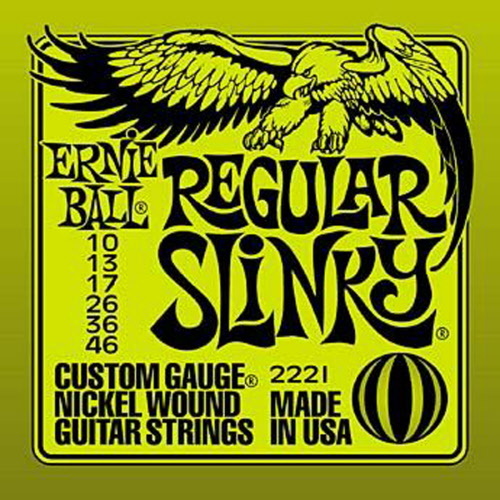 Ernie Ball Slinky strings are high quality strings. They're the favorites of famous artists like Eric Clapton, John Mayor, Slash and Steve Vai. Slinky strings are made of nickel wire, that is wrapped around a steel hex core wire. The result is a richer and fuller tone. 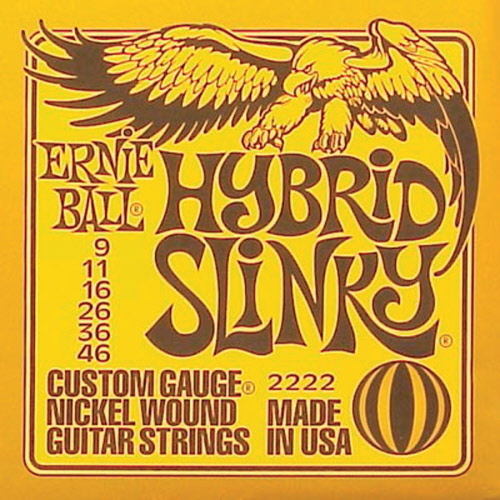 Ernie Ball Extra Slinky strings set for the electric guitar. Material: nickel wound. Version: Extra Slinky. Sizes: 008-011-014-022-030-038. Now on sale from € 7,95 for € 6,75. 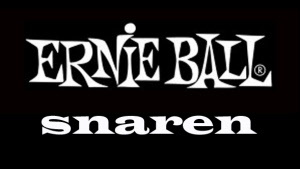 Ernie Ball Extra Slinky strings set for the electric guitar. Material: nickel wound. Version: Super Slinky. Sizes: 009-011-016-024-032-042 . Now on sale from € 7,95 for € 6,75. 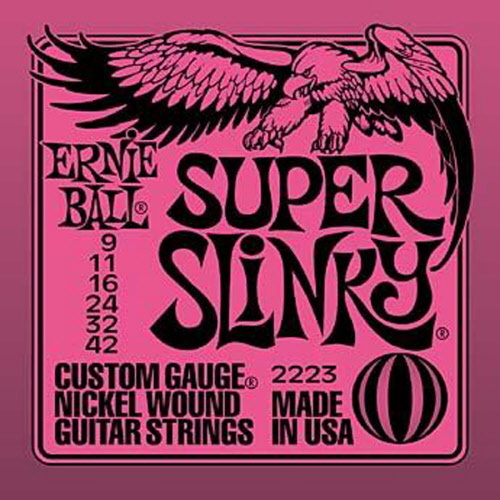 Ernie Ball Extra Slinky strings set for the electric guitar. Material: nickel wound. Version: Hybrid Slinky. Sizes: 009-011-016-026-036-046. Now from € 7,95 for € 6,75. 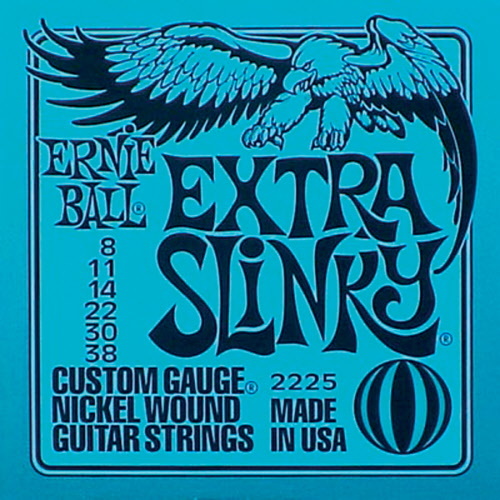 Ernie Ball Extra Slinky strings set for the electric guitar. Material: nickel wound. Version: Regular Slinky. Sizes: 010-013-017-026-036-046. Now on sale from € 7,95 for € 6,75. 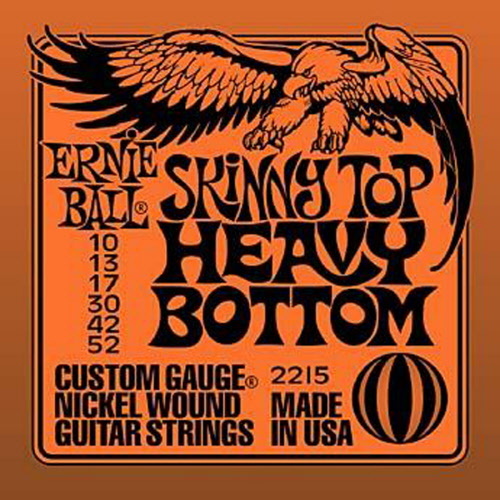 Ernie Ball Skinny Top Heavy Bottom Slinky strings set for the electric guitar. Material: nickel wound. Versie: Skinny Top Heavy Bottom Slinky. Sizes: 010-013-017-030-042-052. Now from € 7,95 for € 6,75. 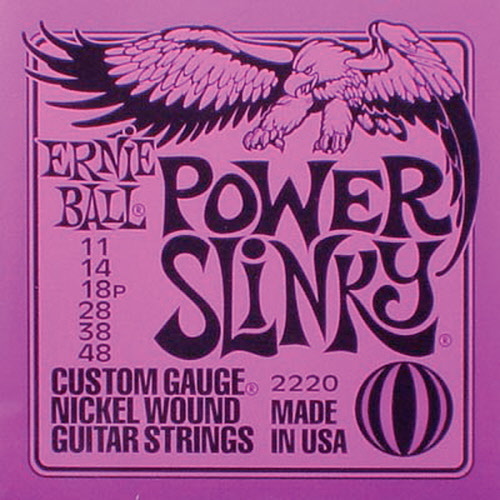 Ernie Ball Power Slinky strings set for the electric guitar. Material: nickel wound. Version: Power Slinky. Sizes: 011-014-018-028-038-048. Now from € 7,95 for € 6,75.